Sunday's slate saw the completion of two unlikely sweeps. 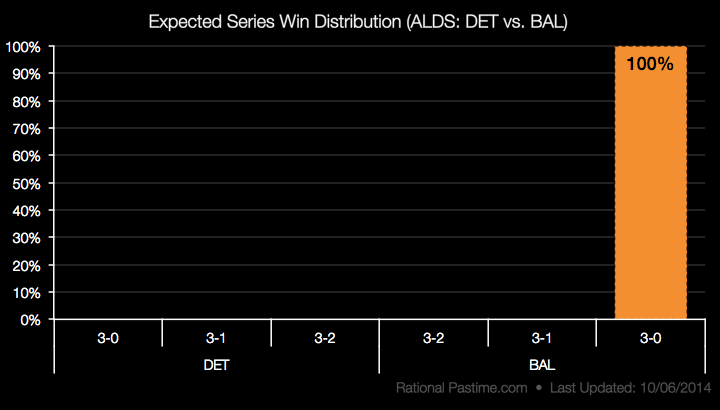 At 15%, a Baltimore Orioles sweep of the Detroit Tigers was the second least likely outcome according to my numbers. 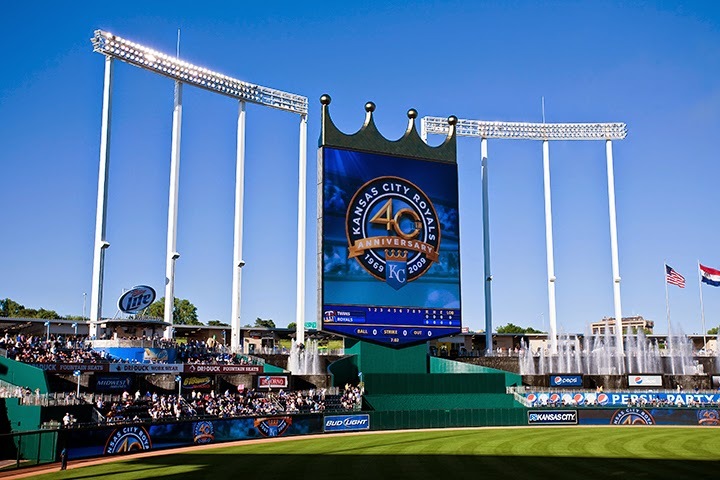 At 8%, a Kansas City Royals sweep of the MLB-best Los Angeles Angels was the least likely result. Despite a combined likelihood of 1.2%, both happened. These results have sent Baltimore's World Series hopes soaring and Kansas City's to the front of a crowded pack. 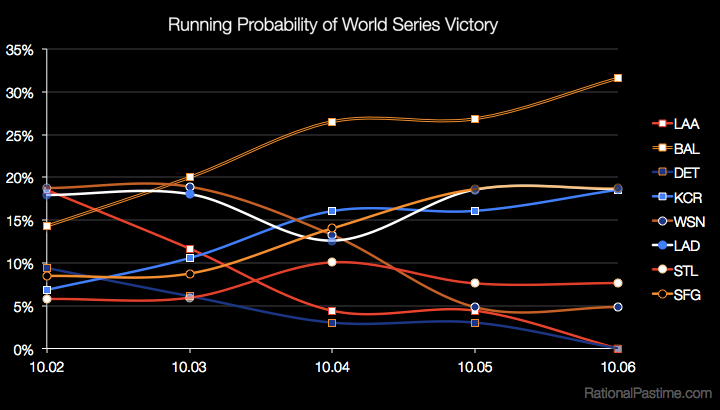 In a blow to both the Angels and my model, an original World Series favorite is now out of the running. In a boon to my model, I had Baltimore winning (in five, not three), while most of the world thought Detroit would walk away with it. While they focused on Detroit's pitching and the Orioles' loss of Machado, Davis and Wieters, I focused on Baltimore's season-long records. Baltimore had a healthy lead on Detroit in every category that comprises the Rational Pastime Power Score, including a substantial lead in the Pythagorean expectation. While it may also be true that analysts underestimated the value of home field in a short series, that proved no comfort to Los Angeles, which lost two games at home in extra innings. Though the Royals have added .009 to their Power Score with the wins over LA, they remain the second-weakest playoff squad. Only time will tell if they can continue making a mockery of my hard work their Cinderella run to the Fall Classic. 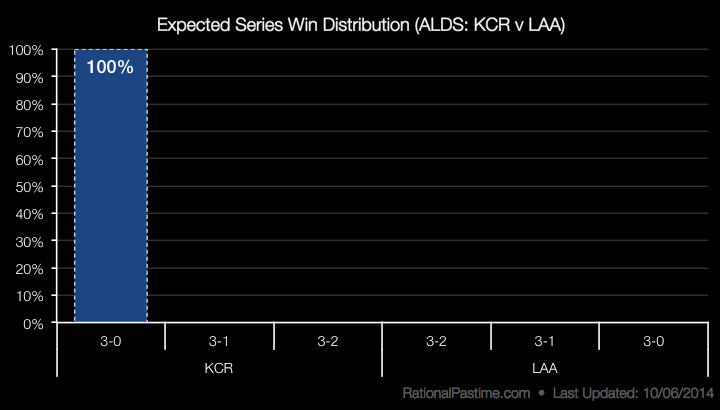 For now, I'm going to stick with my numbers and argue that Baltimore should win the ALCS handily. Currently the Rational Pastime model has them beating the Royals for the AL Pennant 59% of the time, and continuing on to win it all 31% of the time. In contrast, the Royals only seem to have a 19% shot at the ultimate prize. I'll have a more in-depth post the day the ALCS begins, but I expect the most likely outcome to be an Orioles win in six. 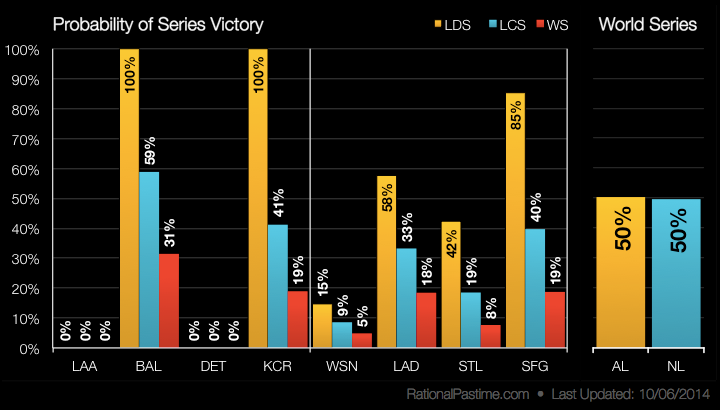 The probability distributions for the NLDS remain the same after the off day (check out yesterday's post to catch up). The Nationals, who are facing their worst odds of the postseason, must win in San Francisco just to stay alive. San Francisco, on the verge of sweeping the Nats and with three chances to move on, enjoy an 85% chance to win the ALDS, a 40% chance to take the NL Pennant and a 19% chance at winning it all. The other NLDS between the Los Angeles Dodgers and St. Louis Cardinals resumes today. Currently deadlocked at 1-1, the Dodgers are currently 58% favorites to advance, a 33% shot to win the NL Pennant and an 18% chance to win it all. Their opponents are 19% to take the NL Pennant and, as the weakest team in the field, 8% to win the World Series. For the third consecutive day, a Baltimore win over San Francisco in six or seven remains the most likely World Series outcome. The fall of the Angels and the caging of the Tigers has eliminated four "interesting" World Series match-up possibilities. Sorry, baseball fans: no rematch of the 2012, 2006 or 2002 World Series, and no Golden State Fall Classic, either. On the other hand, at 4-1 odds a rematch of the '66 tilt between the Orioles and Dodgers is now the most likely of the group. Stop by tomorrow for updated ratings, probabilities and charts following today's NLDS match-ups including another possible series sweep.